Updated with the 51-tooth fast-attach mounting system, the 762-SD provides reliable, precision accuracy with minimal and repeatable zero-shift. Users have the ability to install or remove the silencer from the Blackout™ flash eliminator within seconds while being subjected to the harshest environments. Extraordinary sound and recoil reduction are two of the instant benefits of the 762-SD. Durability is maximized by fully CNC automated fusion welding of every high-temperature aerospace alloy component used for its construction - making 100% suppressed fire possible. The back-pressure lowering design of the silencer aids in shooter comfort, reduces weapon fouling, and minimizes cyclic rate increase. As a final step, tapered-bore EDM technology is utilized to ensure precise bore alignment resulting in enhanced accuracy and maximum performance. The elimination of approximately 95% of the muzzle report nullifies the need for ear protection, preserves field communications, and masks the location of the user. The AWC Spec M1™ silencer is the most effective and compact device available for the M1A/M14 rifle systems adding approximately 6.5 inches to the length of the barrel. The SPEC M1™ suppressor was originally developed for our Model G2 Rifle in the configuration of the Spectrum 2000. The rifle was a Bullpup design utilizing the M1A/M14 barreled action. This was a limited production run for several SPEC OP units. In mid 2002, a new requirement by the Government caused us to produce this suppressor once more. In early 2009 dramatic changes were made to the already fantastic Spectrum 2000 suppressor. Our continuous R&D program resulted in the new AWC Spec M1 7.62 silencer. Among the many innovations the Spec M1 features a reduction in weight, a new complex heat distribution system and enhanced overall performance using our advanced frequency shifting technology for which AWC is well known. 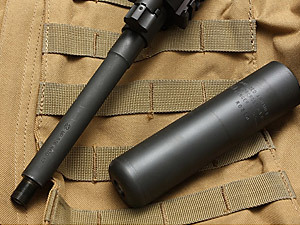 This suppressor reduces muzzle blast to a level well below that of a .22 caliber rifle, the flash signature is eliminated and the recoil is significantly reduced providing a perfectly balanced instrument. All of this is accomplished without any modifications to the barrel. A short, efficient suppressor for rifles chambered in 7.62x51mm NATO and .30 caliber cartridges of similar case capacity, the Gemtech HVT sets the bar for endurance and reliability. It is offered in either threadmount or maintenance-free Quickmount fast attach configurations. The HVT has an unusually quiet sound signature that is indistinguishable from, and masked by, the bullet flight noise, making it ideal for both urban and rural tactical operations. Recoil and visual signature (flash, dust) are reduced greatly along with the audible signature. With our high-accuracy / low-blowback baffle design that the U.S. Navy deemed "highly favorable" in limiting rate-of-fire increase, the HVT makes for an excellent choice on automatic rifles as well as bolt-action precision rifles. Thread mounting HVT suppressors normally are threaded 5/8-24, the U.S. industry standard, found on Armalite, DPMS, and other AR10 type rifles and many threaded bolt action rifles. On special order, the thread mount version HVT can be supplied with metric M18x1 threads found on a number of European rifles such as the SIG Blaser and SAKO. Answering the call for the lightest, shortest 7.62 suppressor available, the Gemtech SANDSTORM brings high performance in an extremely compact and lightweight package. With no compromise made in any design parameter, its titanium construction is stronger than steel, trimmed and tuned until no excess remains. Lighter weight translates into lessened point of impact shift, less harmonic disturbance to the barrel, and the titanium allows for faster cooling of the system - all making for a very accurate weapon light enough to pack with you through the longest trek. Premium sonic reduction is achieved even with forgiving baffle apertures (no extra tight "cheater" exit hole that can lead to dangerous baffle strikes). An all new baffle design gives better accuracy while still aggressively muting sound and flash signature. Thread mounting to fit .308 or like-caliber bolt action or semi-auto precision rifles in either U.S. standard threading of 5/8-24, or for the Accuracy International rifles in 18x1.5M threading. Whether it's called on for a surgical shot at 75 yards, or hits at the outer limits of 30 caliber performance, this suppressor has become legendary with incredible suppression, and enhanced host weapon accuracy.